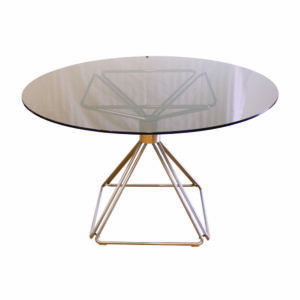 Rare and elegant Pyramide dining table designed by Rudi Verelst and manufactured in Belgium, in the 1970s, by Novalux, Belgium. 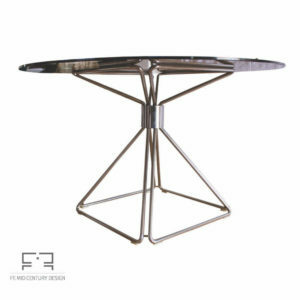 It features a circular table top made of glass resting on a chrome tubular pyramid base extending into a smaller inverted pyramid shape. The table is in good vintage condition. 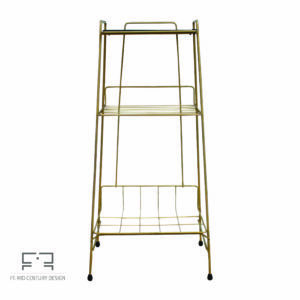 Elegant Art Deco hallway stand made of brass in 1950s in Germany. 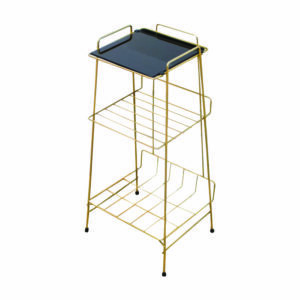 The stand has two brass shelfs and a top made of black glass. 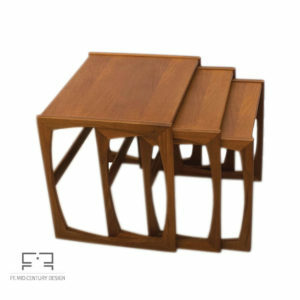 With a geometric and minimalistic look, this Art Deco piece of furniture is very light and will be an non-intrusive yet chic presence in any hallway. The item is in good vintage condition. 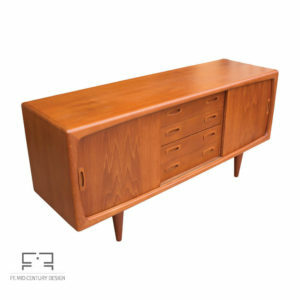 Beautiful and exquisite Danish design sideboard (credenza) designed and produced by H.P. Hansen in the 1950s. 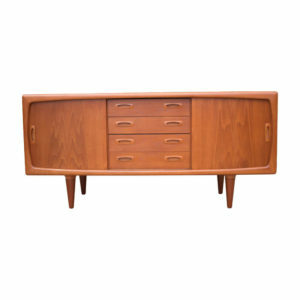 The sideboards organic shape and teak wood grain look lovely. The sideboard has 4 drawers and multiple adjustable shelves behind the 2 sliding doors offering plenty of storage space and options. This is a nice small model which are rare to find. 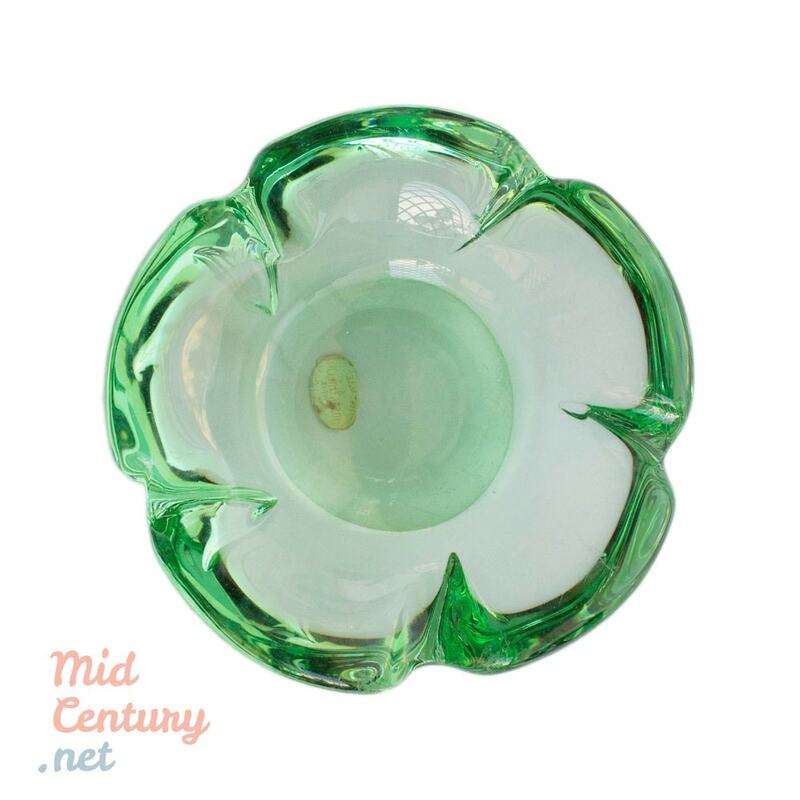 This piece is in very nice vintage condition. 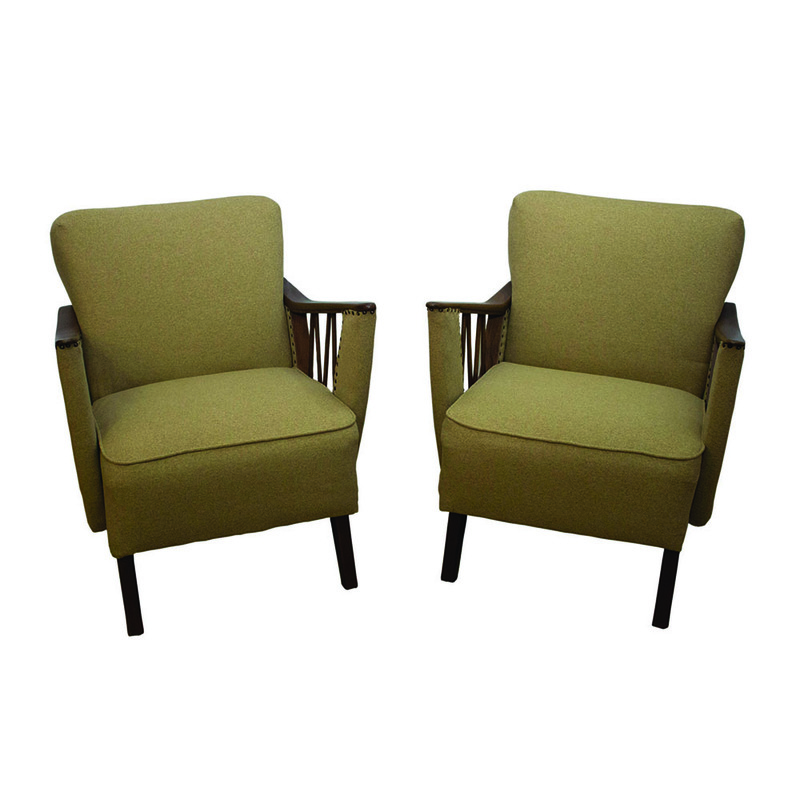 Beautiful pair of swivel armchairs manufactured by Stamp in Nurieux, France, in the early 1970s. 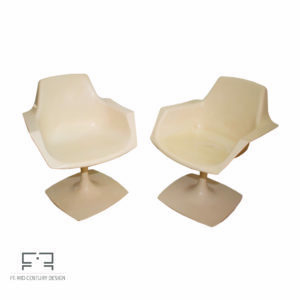 Made of moulded thermoplastic and designed in 1972, this model recalls the Tulip armchairs of Eero Saarinen and features the emblematic lines of Space Age design. Having two new yellow cushions that comes with them and being very comfortable and ergonomic, this pair of chairs can fit in any interior. 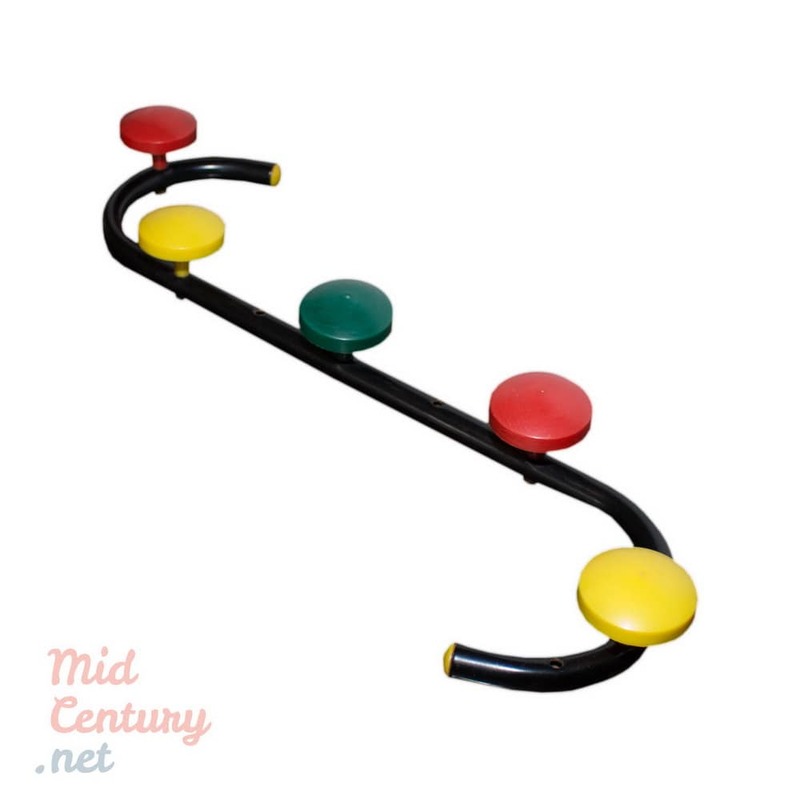 Colorful Atomic Age wall coat rack made of metal and colored hard plastic. 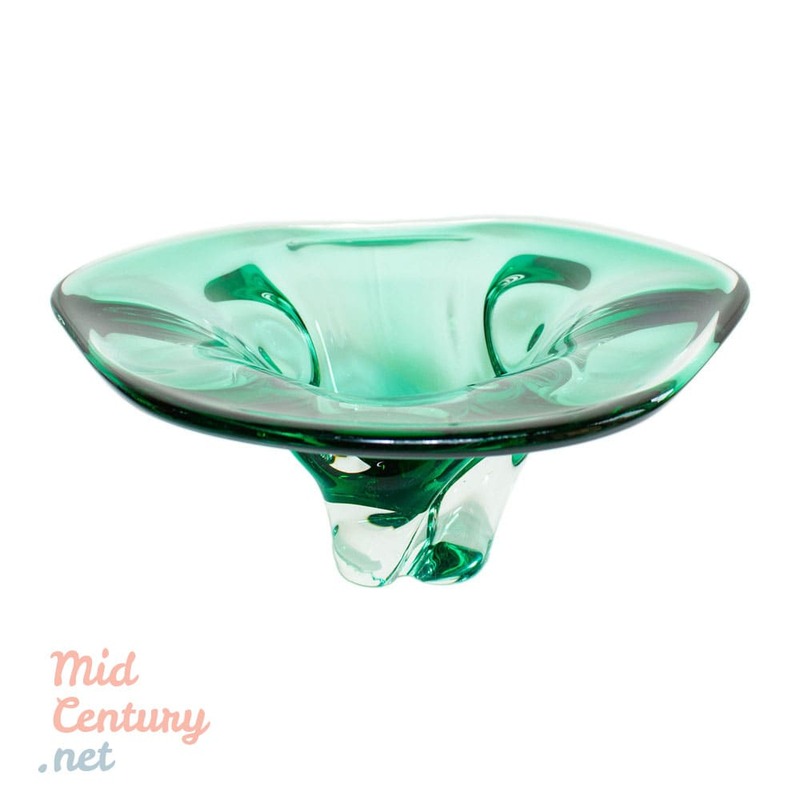 The piece is produced in France, probably in the 1980s and features clean, geometric forms and a joyful look. The item is kept in very good vintage condition. 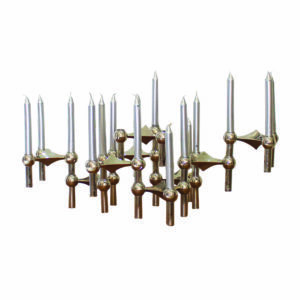 Set of 9 candlesticks (model S 22) made of chrome plated steel and produced by BMF (Bayerische Metall Fabrik). 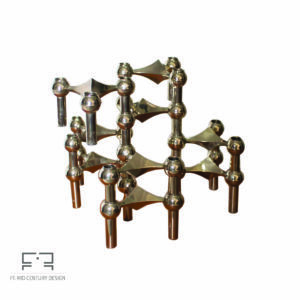 This stackable candelsticks were designed by Fritz Nagel and Ceasar Stoffi in the 1960 and are considered icons of the Space Age / Atomic Age design. The Model 22 was in production from 1965 to 1970. The pieces are in very good condition, with no deterioration and only little traces of use. 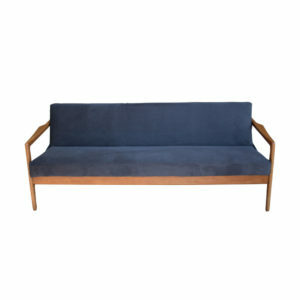 Beautiful late 1950s Danish modern daybed (Model Minerva), designed by Peter Hvidt & Orla Mølgaard Nielsen, produced by France & Son. 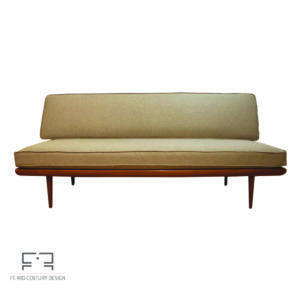 The item features a teak wooden frame and renewed green upholstery. 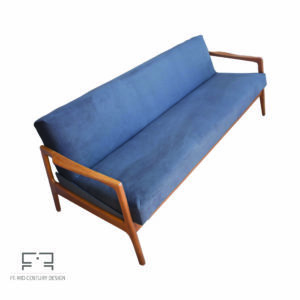 The minimalist look of this sofa is characteristic for the Scandinavian design of that era and can easily fit any contemporary interior. The sofa has its original label mark. Set of two large Clan floor lamps by Harvey Guzzini for Meblo. 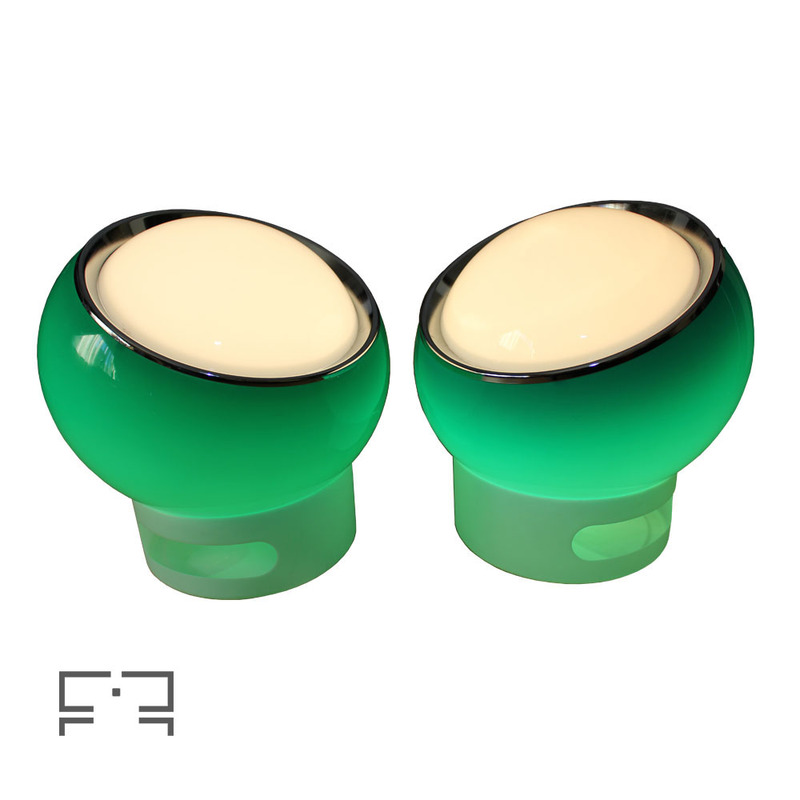 The great modern form emits a beautiful, warm green glow. 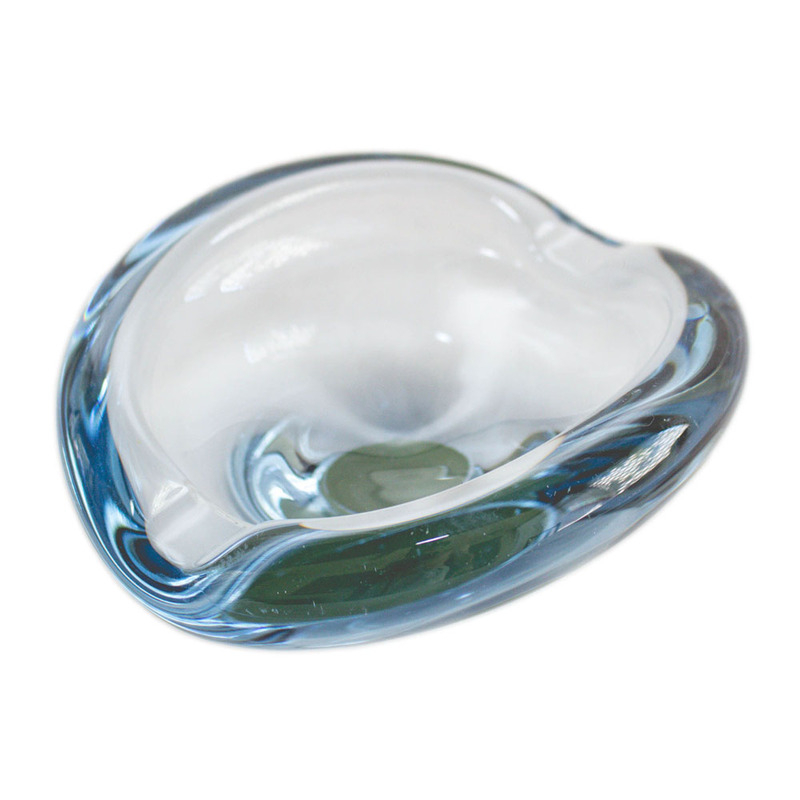 Soft light is diffused through the graduated tint of the acrylic globe shade. 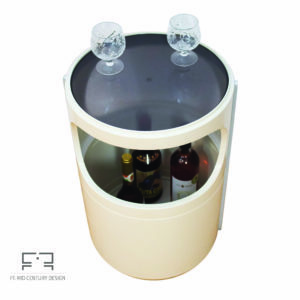 The white acrylic dome top rests in an chromed metal ring frame and lifts to reveal a translucent white interior and a single medium base socket. 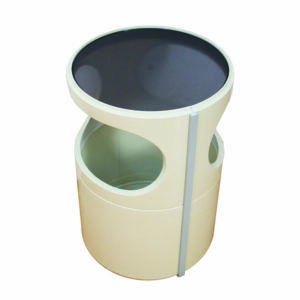 The lamp rests in a cylindrical fiberglass base which allows directional positioning of the light source. 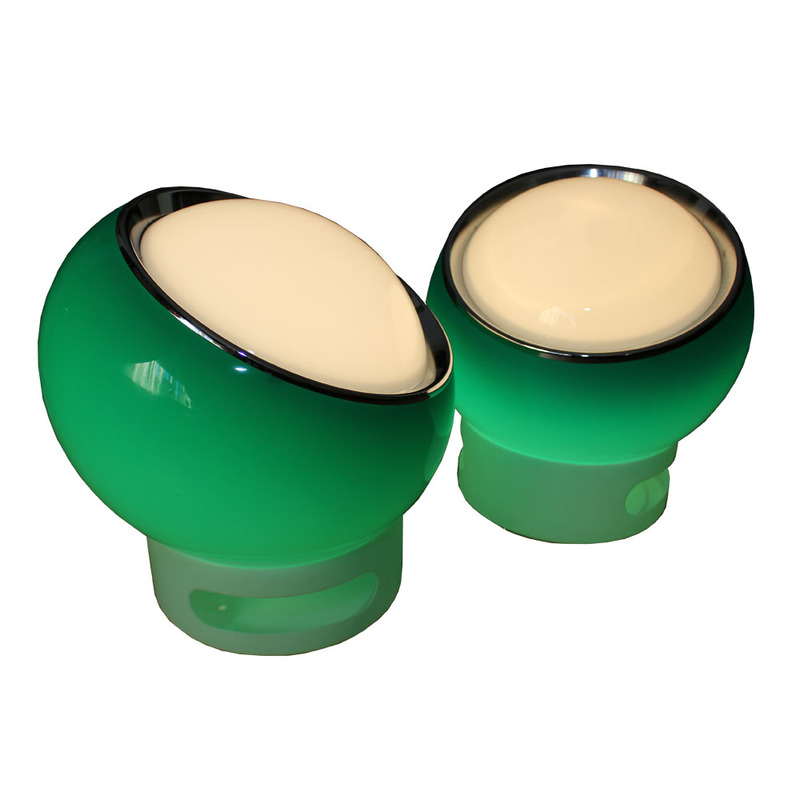 If you are interested in buying just one of the two lamps, the price is 500 euros. Please contact us on [email protected] for details. 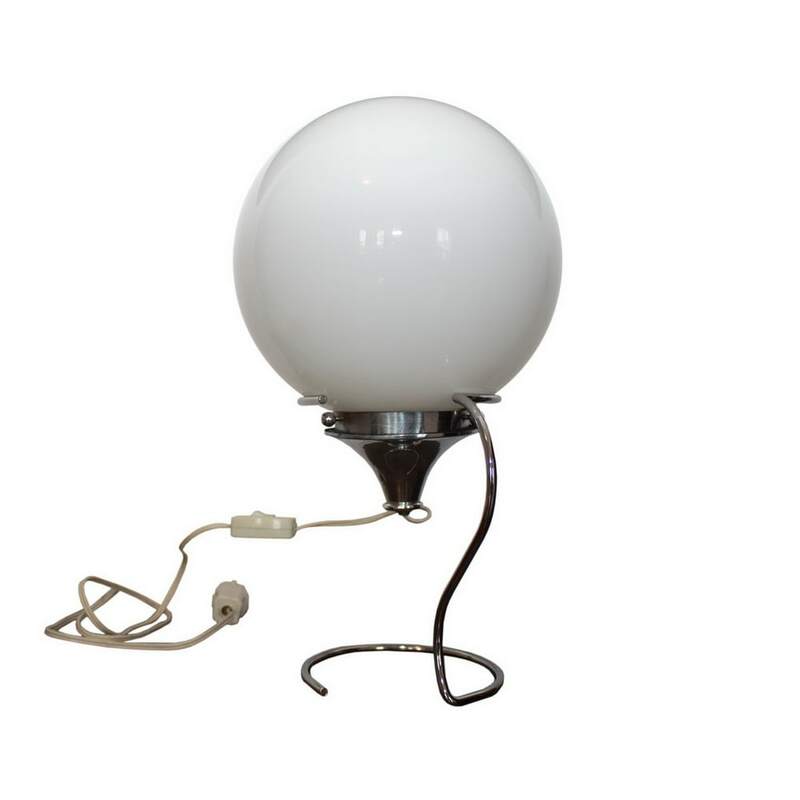 Harvey Guzzini is often mistakenly thought to be the name of a lighting designer active in the 1960s and 1970s. But in fact the label belongs to a lighting manufacturing company, which was founded by six Guzzini brothers - Raimondo, Giovanni, Virgilio, Giuseppe, Adolfo and Giannunzio - who were inspired by the 1950 film Harvey starring James Stewart. Compounding the historical record even further, it seems that the Guzzini company rebranded many times in the 20th century, going by, at various points, Harvey Creazioni, Harvey Guzzini, Guzzini, iGuzzini, and Illuminazione Guzzini. Harvey Creazioni was originally founded in 1959 in Recanti (on the east central coast of Italy) by Raimondo, focusing on the production of copper-plated decorative objects. Four years later, in June 1963, the six brothers joined together and established Harvey Creazioni di Guzzini, expanding production to include pendant lighting, sconces, and lamps, floor lamps. The brothers employed architect-designer Luigi Massoni—who was introduced to the Guzzini brothers by leading plastic importer Maurizio Adreani—as head of design, branding, public relations, and advertizing. 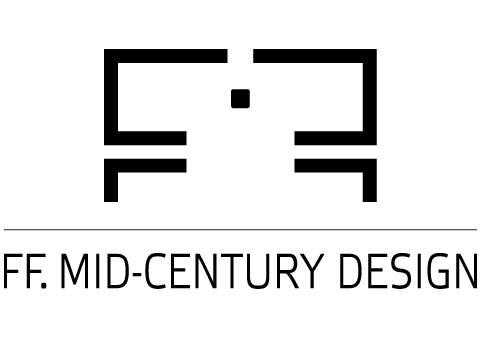 Famous Harvey Guzzini designs include Massoni and Luciano Buttura's Mushroom Table Lamp (1965), as well as the in-house designed Arc Floor Lamp (1968), Faro Table Lamp (1970), and Toledo Table Lamp (1973). Studio 6G, an interning design team, developed the collectible Clan Lamp (1968); and designers Ermanno Lampa and Sergio Brazzoli were responsible for the Nastro Series (1970), Orione Pendant (1970), Sirio Table Lamp (1970), Alba Floor Lamp (1973), Albanella Table Lamp (1973), and Alf Series (1976). 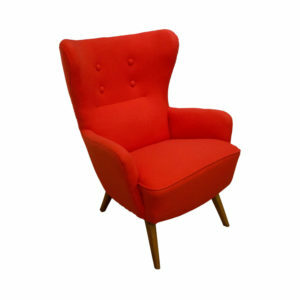 Beautiful red Wing-back armchair made in the 1970s in Denmark. 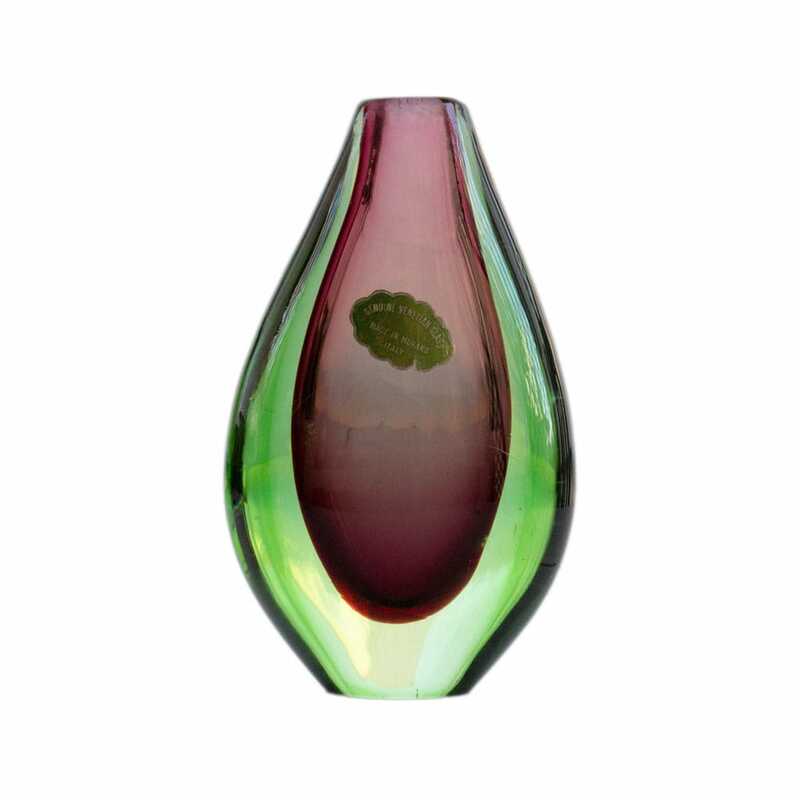 The item features a nice organic shape and a bright red color. The armchair has a new upholstery (containing wool and cashmere) that respects the original color and texture. 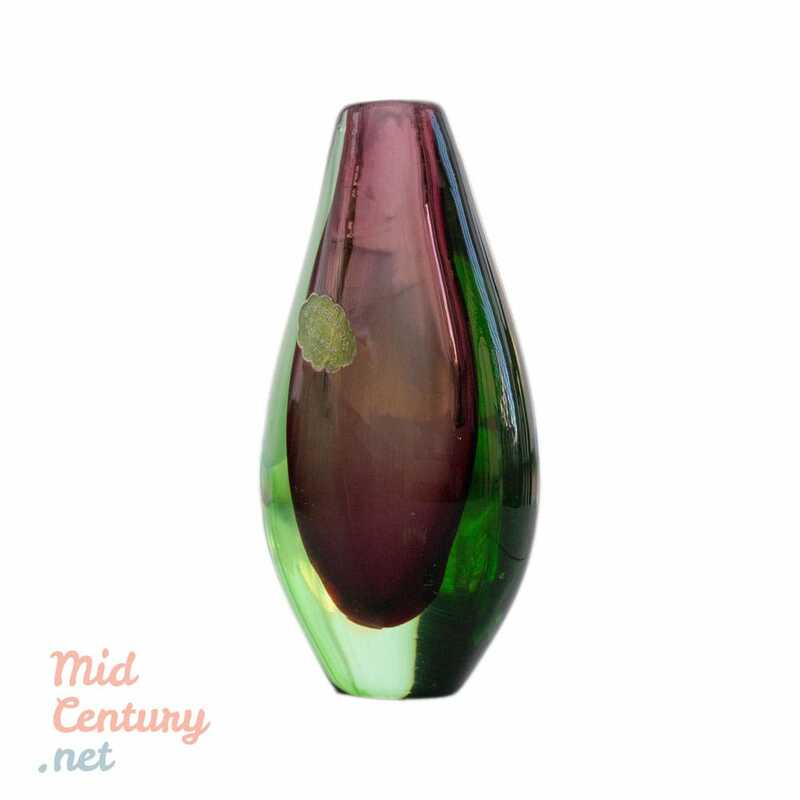 The beautiful Space Age design of this piece is characteristic for the Danish design of that period and, furthermore, for the Scandinavian Modern. 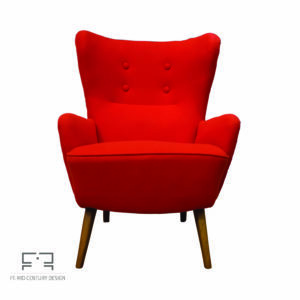 This armchair will be an exquisite touch to any room in your home. 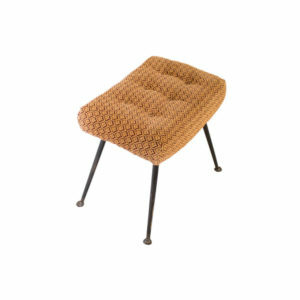 German stool made in the late 1940s. 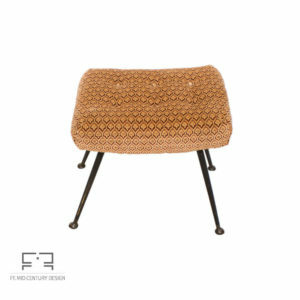 The item features its original upholstery and flared legs made of painted bronze. The item is in overall good vintage condition but has some signs of ware consistent with its age. Please see photos for details. 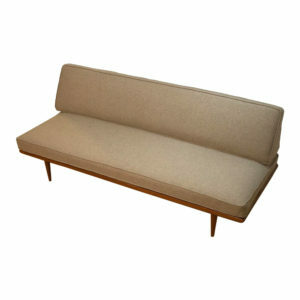 Elegant Mid-Century sofa bed made of cherry wood in Denmark, in the 1970s. 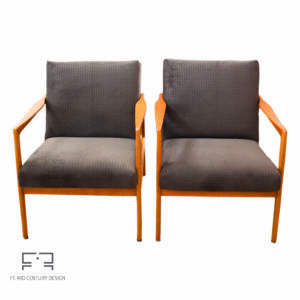 With a newly restored upholstery in dark grey, this items are in excellent vintage condition. 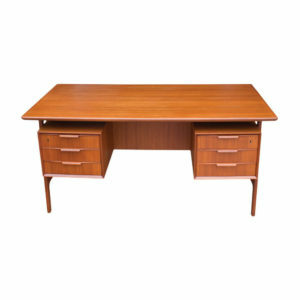 The minimalist and modern look is emblematic for the Scandinavian furniture of that time. The cherrywood armrests are quite sculptural and features the iconic organic lines of Nordic design. This sofa can prove itself very practical because is extendable, so you can use it also as a bed. 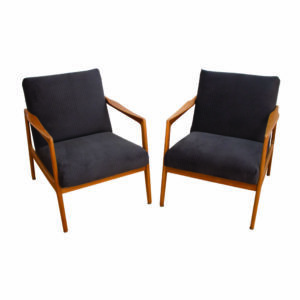 Two beautiful Mid-Century armchairs made of cherry wood in Denmark, in the 1970s. 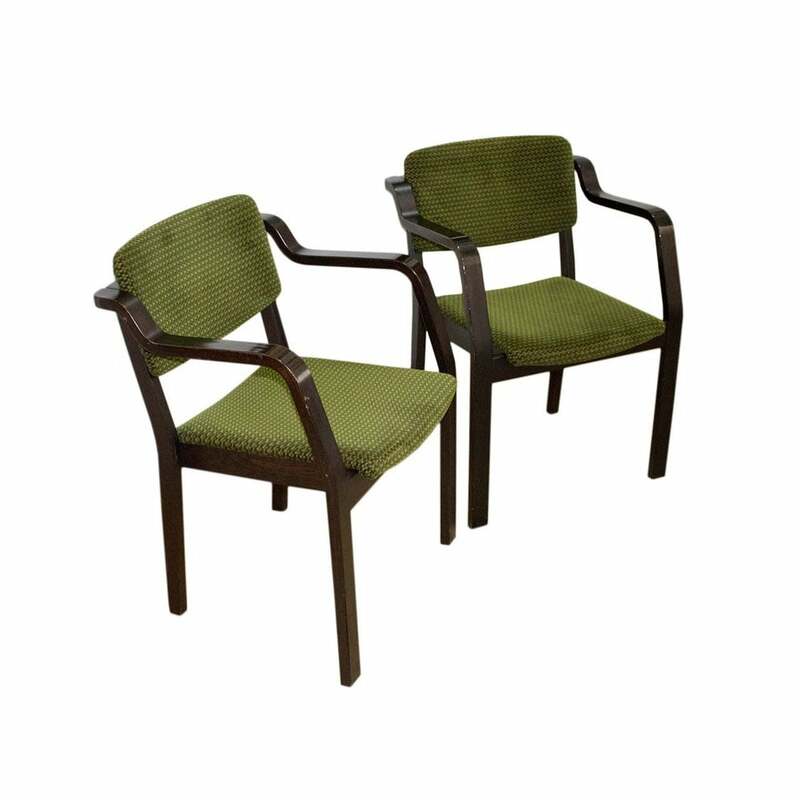 With a newly restored upholstery in dark grey, this items are in excellent vintage condition. 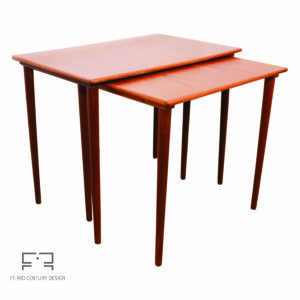 The minimalist and modern look is emblematic for the Scandinavian furniture of that time. The cherrywood armrests are quite sculptural and features the iconic organic lines of Nordic design. 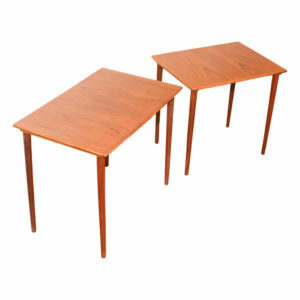 Elegant set of 3 Quadrille nesting tables made in the United Kingdom, in the 1960s. 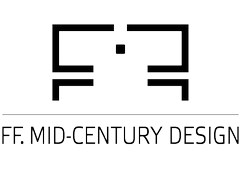 The design is inspired by the organic, Nordic lines of the Mid-Century. 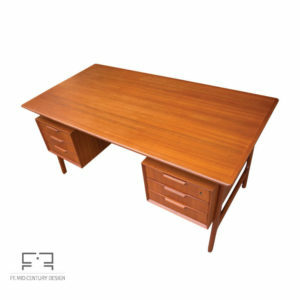 The tables are made of teak and are in very good vintage condition. On the bottom, one of the tables has the original label of the maker (G-Plan). 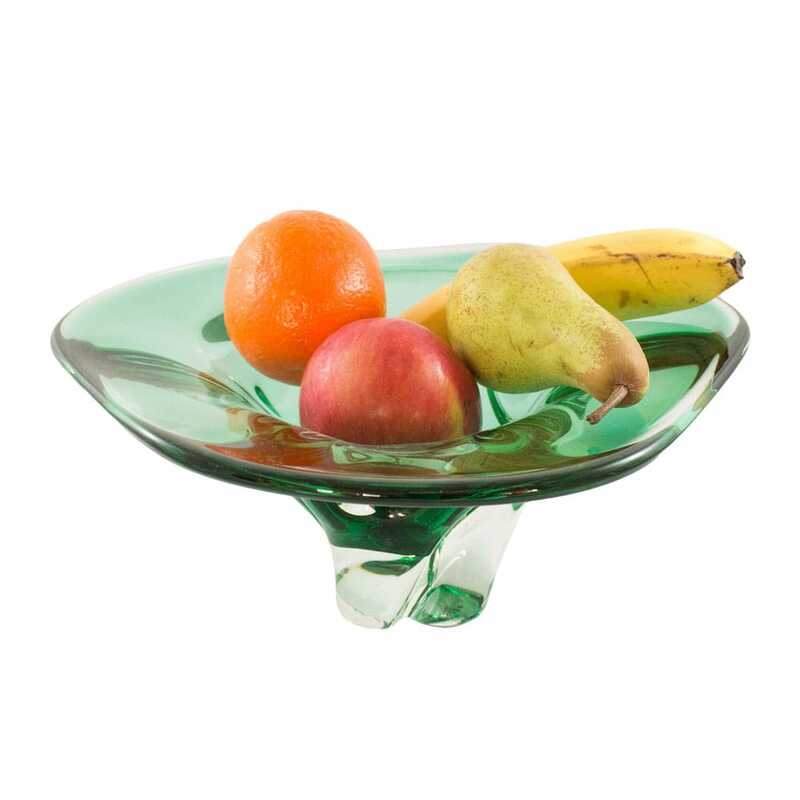 This exquisite, nicely finished set can be a beautiful touch to any contemporary interior. Beautiful ceiling lamp made in Germany in the 1970s. 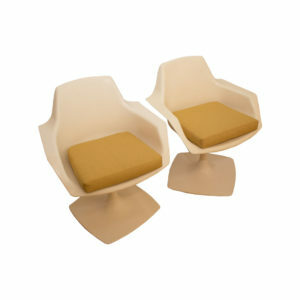 The item is designed by Richard Essig following the aesthetics of Space Age design. 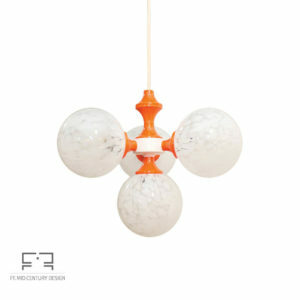 The lamp is made of plastic and glass and features some really nice orange accents. The piece is kept in good condition and is in full working order. 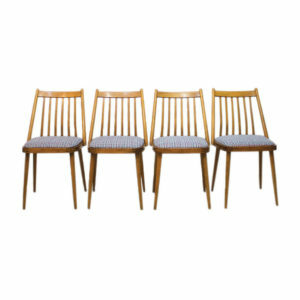 Beautiful set of 4 Hungarian chairs designed in 1957 by Gábriel Frigyes for SZKIV Budapest. 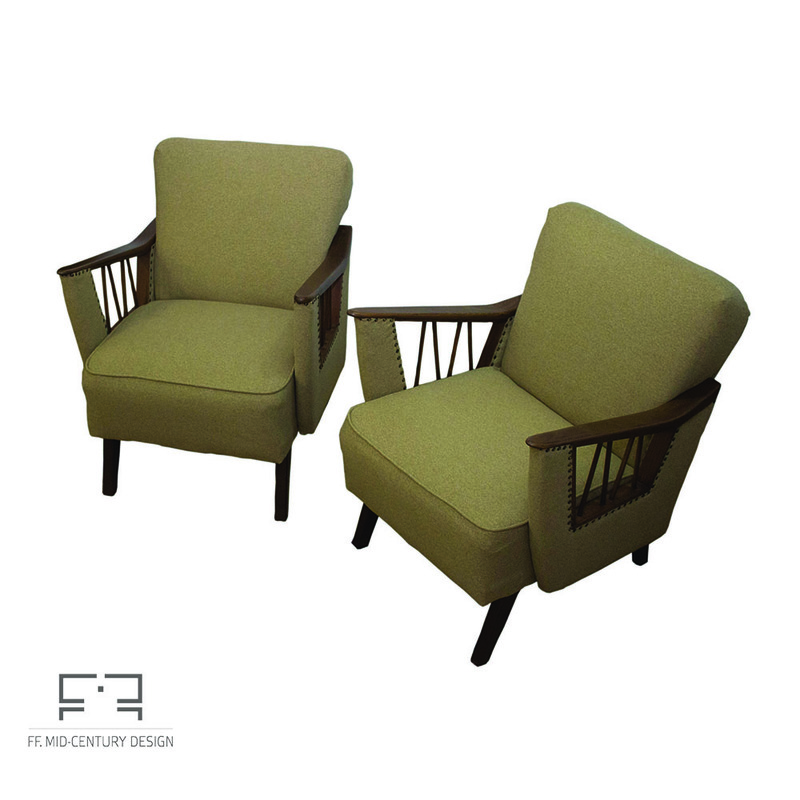 The chairs are made of wood and they feature a very nice colored upholstery. In creating this items, Gábriel Frigyes let himself influenced by tradition of the Scandinavian bent furniture. 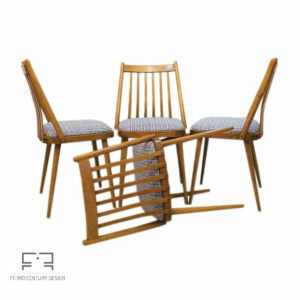 Utility, harmonious design are the main merits of this chairs bent of beech wood and built from different units. The chairs are in good vintage condition. All defects are visible in the photos. 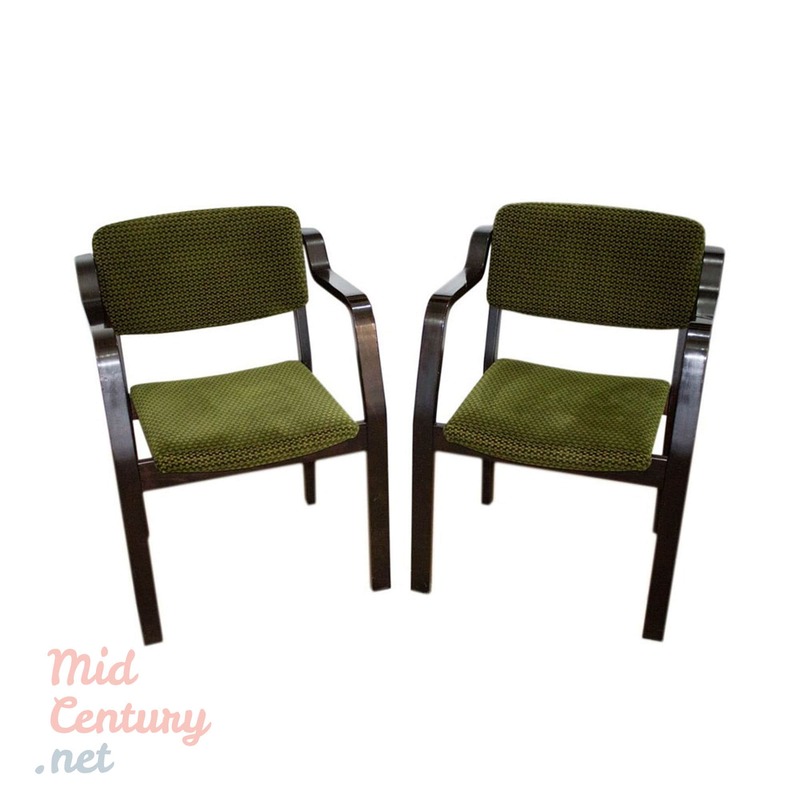 Beautiful pair of Mid-Century armchairs made in Germany in the 1950s. The items have a robust yet elegant look and features the sober lines of the Central European Modernism. The armchairs have new upholster in the same color as the original one. Also the decorative pins were applied manually. The items are in very good vintage condition and they can fit (and warm) any interior. 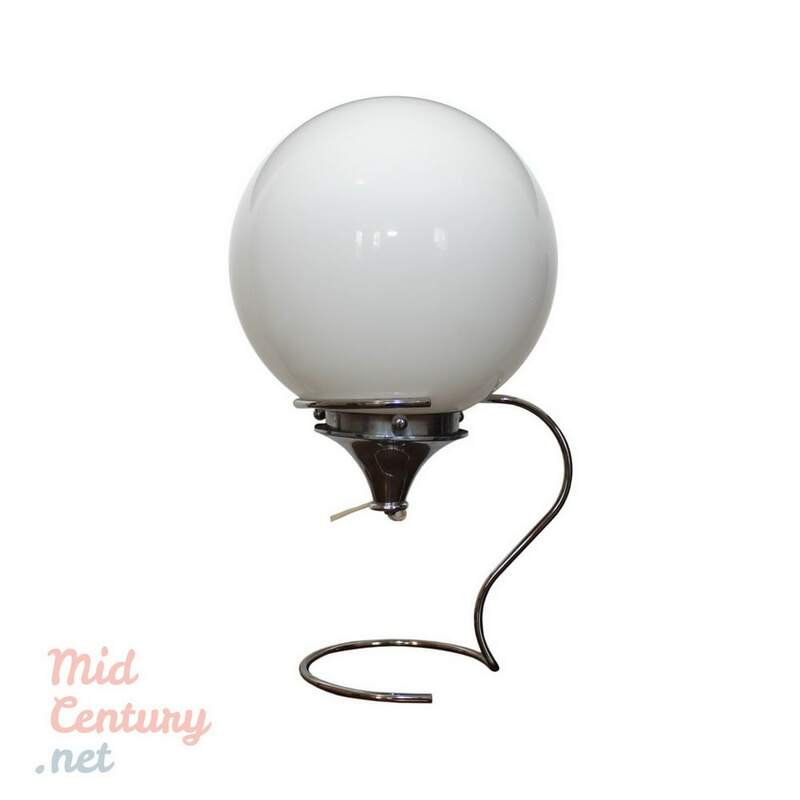 Suave and elegant globe table lamp made in France in the 1970s. With a minimalist design, this lamp features a spiral, discrete metal support as a lamp base. 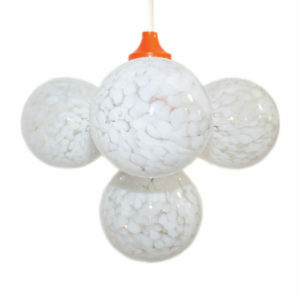 The opaque white globe falls both into Pop and Atomic Age aesthetics. The lamp has it's original electrics, including the plug and the switch. 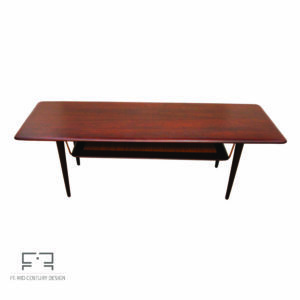 Beautiful Minerva (model FD516) coffee table designed by Peter Hvidt and Orla Mølgaard-Nielsen and manufacturedf by France & Daverkosen in Denmark, in the 1950s. 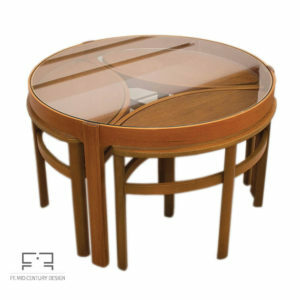 This two-tiered cocktail/coffee table was designed in 1956 and it's made of solid medium-dark teak and rattan. 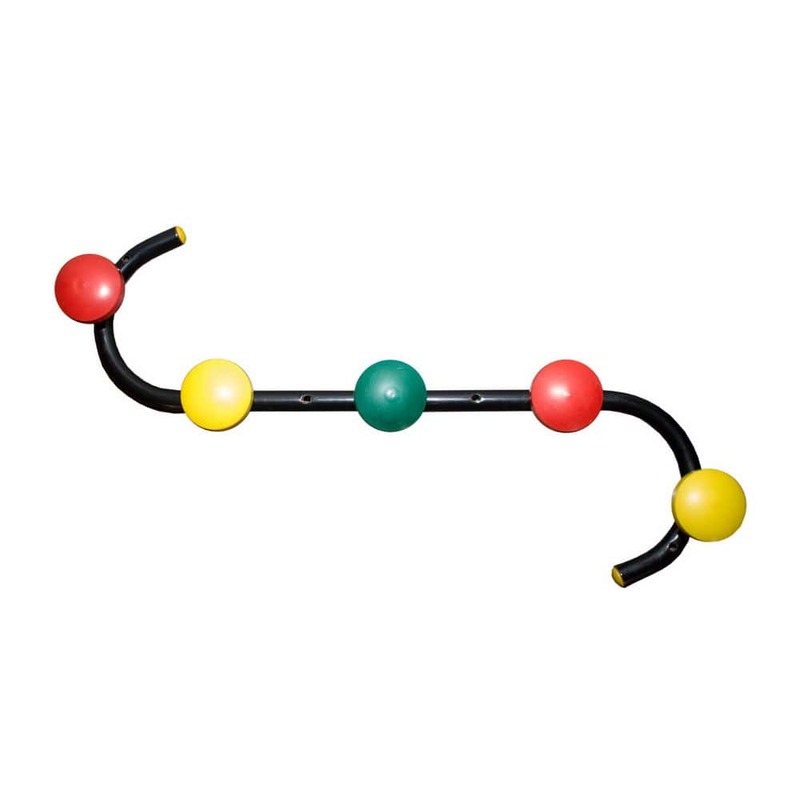 The legs are connected with brass angled supports. The item is in good vintage condition. 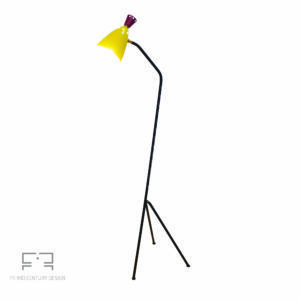 Beautiful and colourful tripod floor lamp made in the late 1960s in Italy. The lamp is made of metal. 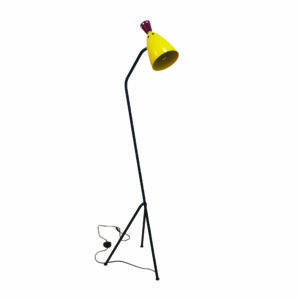 With a black body and a yellow and red lampshade, this item is a joyful presence in any room. 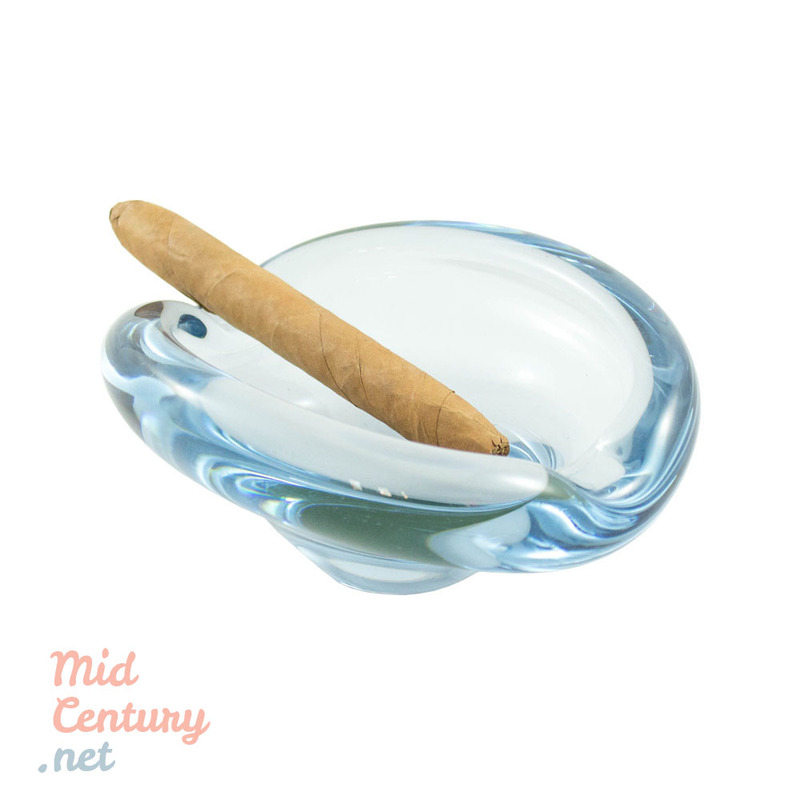 Designed in the philosophy of Space Age, this item is very slim and discreet. It is in full working state. All the minor defects (consistent with its age) are visible in the photos. 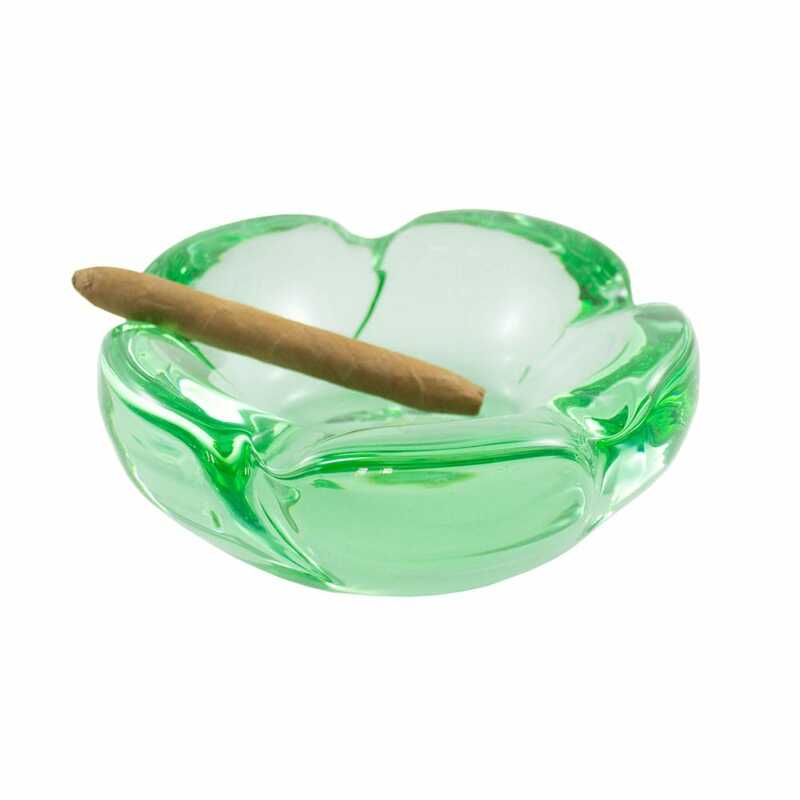 Beautiful Akva ashtray for two designed by Per Lütken for Holmegaard. This model is part of the Akva series, which was a huge success and remained in production for more than two decades between 1953 and 1974. 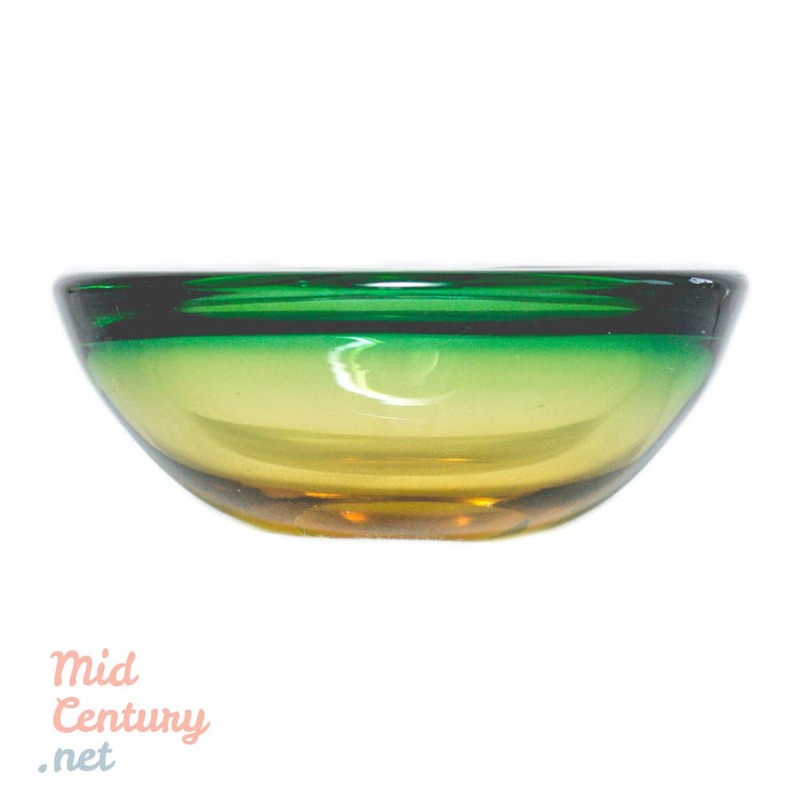 A rare piece made from hand-blown glass. 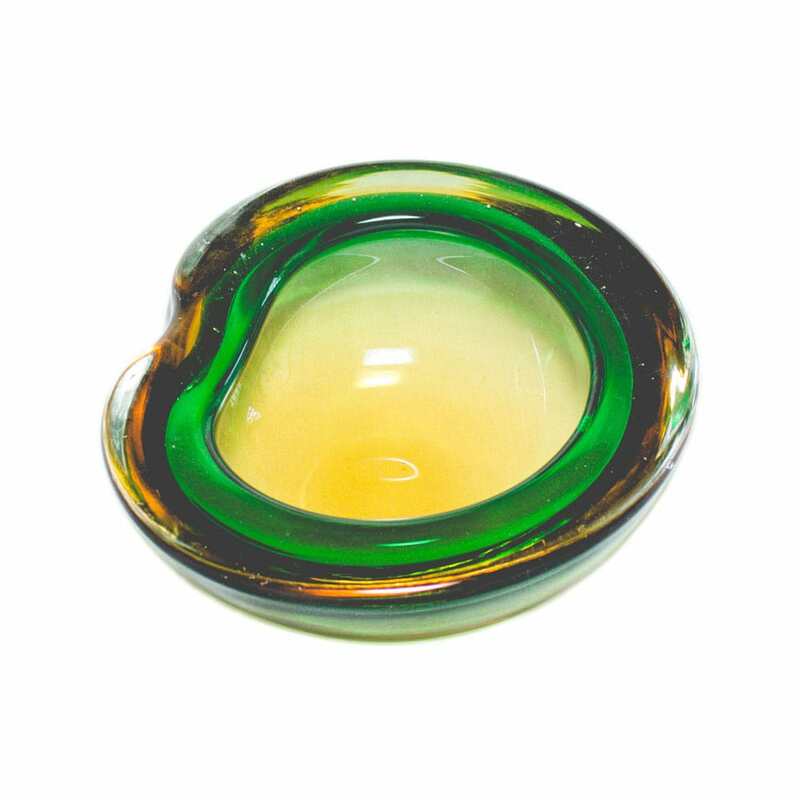 The Akva series includes items sold under different trade marks and line names: Askebaeger, Dukling, Fiona, Hellas, Lysestage, Menuet, Rondo, Selandia, Thule, Umanak, Surf etc. 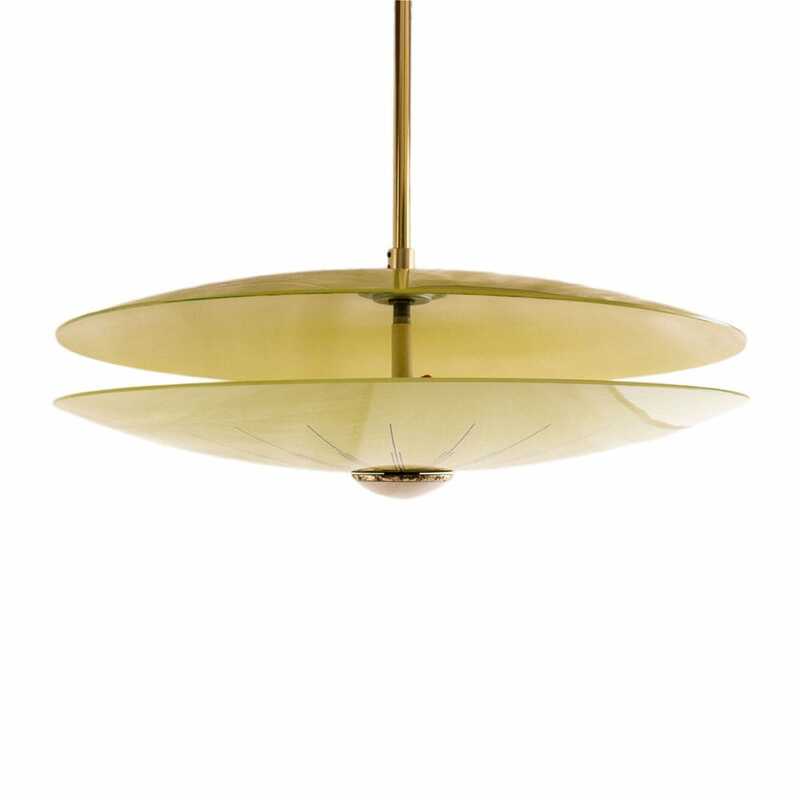 Spectacular UFO Space Age ceiling light made in Germany, in the mid 20th century. The light consists of two plates of yellow glass with geometric decorations (black lines). 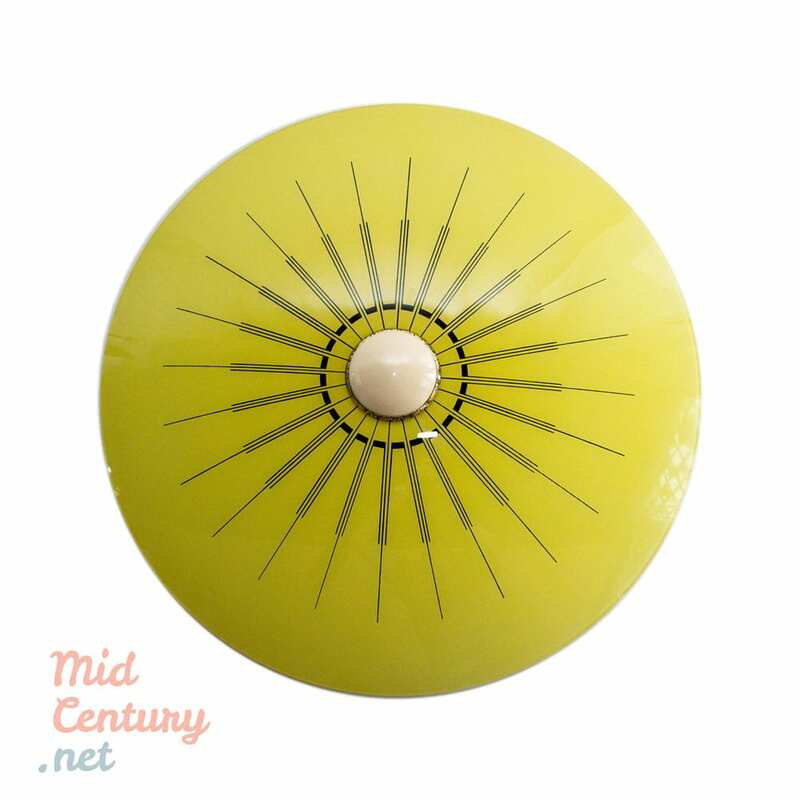 Made in the 1960s and resembling an UFO, this is a representative piece fort the aesthetics of the Space Race era. The Space Age is a time period encompassing the activities related to the Space Race, space exploration, space technology, and the cultural developments influenced by these events. The Space Age is generally considered to have begun with Sputnik (1957). During the 1950s, architecture, furniture, interior design, cars, and gadget design took on a curiously spaceflight-inspired aesthetic. 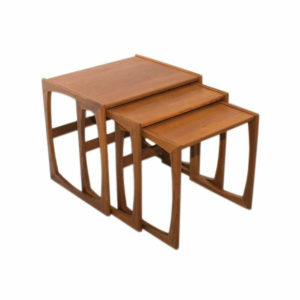 Set of Trinity nesting tables from Nathan. 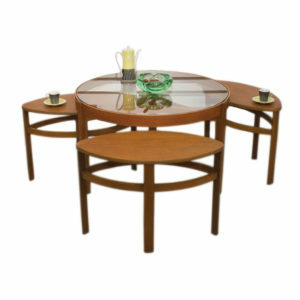 The set consists of a large coffee table (with a glass top) and 3 small tables. 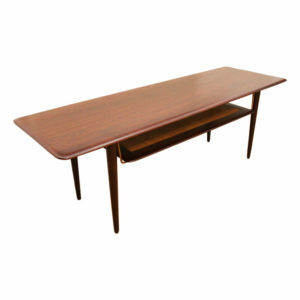 The tables are made of teak and are in very good vintage condition. The Nathan Classic Shades and Editions ranges all work to capture the essence of timeless design.. The natural variation in color and grain which is the beauty of real wood gives every piece of Nathan Furniture its own distinct character.